Imagine the renaissance pleasure faire. Now, instead of the past, make it in the future, a sortof Mad Max future. Much entertainment involves fire. Bands play and at the end they torch their sets. You know it's like one of those all-night blues festivals. Except the music is all different. I drove out by myself this time, car loaded up with like everything. I really recommend driving up during daylight. The cactuses and the scenery, you really should not miss. You get an idea of what's going on. A lake. The sun gets hot, the rainfall gets sparse. So you get these lakebeds that are entirely dried out, or maybe a stream cutting through what used to be a prowd body of water. North of camp is several rave sites. You can go there and dance, 24 hours a day. So I arrived and couldn't find anybody, so I went riding my bike around. There was this altar on the way to the man. That monument, in the foreground on the right? It was sooo cool. The foundation was made of native mud cementing together bricks, sortof. They weren't bricks, they were books. Books that were open, as if someone were reading them. All laid on top of each other like bricks or a big pile on your desk. It was like the world that we have, built on top of the knowledge of those who came before us. The middle, you can see some light shining through? It was filled with water, like an aquarium. Air was bubbling through. I couldn't recognize what was in it, but it was pretty gross looking. Primordial soup. The top looked like some chinese... something. Made of paper and wood. They torched it at the end. Finally I met up with Greg and Jim and we set up camp and went into town for the evening's parties. So after I was coming back from the central camp and parties, I got lost. As usual. I ended up in the desert at night. What a sky. I had my bike so I could go anywhere, but I didn't want to go anywhere, I wanted to go back to my camp and my car. I was really drunk and couldn't think and I was lost. (Turned out I went North NorthEast instead of North NorthWest.) So I parked my bike standing up and slept on the playa. You park your bike standing up so if a car comes by in the night he won't just run over ya. So twice while I was sleeping and trying to regain a brain, a car stopped and asked if I was OK. You're driving around at nite. you see a dead body lying next to a bicycle. Maybe you check to see if the guy is still alive. OK. So this one time this guy gets out of the car. You can see this by moonlight, the moon was more than half. He comes right over to me and says "Here. Take this hat. Wear it around. If you see someone else wearing the same hat, go over to them, look at them face to face, and say 'quack quack quack'." He had a box of them. It was like a bright yellow baseball cap, except that the visor was really long, like a foot in front of your face. Looked really stupid. But I was like, OK I'm game. It was a great hat. Totally goofy, but during the day it would shade your face from the sun. And big time. For the whole rest of the trip, I never saw another person wearing that hat. Someone had taken scraps of old pianos and had nailed them together into a huge... thing. There were four walls, a few doors to get in and out, but no roof. It was like an old wooden house, except that everywhere there were piano wires strung tight, and there were scrap piano keys, broken from their pianos, lying around. You could just pick up one and start banging on piano wires, making sounds. And everybody was. It was a big noisy cacophony, but it was strangely a lot of fun. At the end, they torched it. I brought a minikeg of Sierra Nevada and it stayed cold for two solid days. I had spent all this time beforehand researching how to keep a keg warm when it was desert heat out. My plan was to use dry ice, because regular ice melts to water and makes a big mess and eventually conducts heat anyway. Dry ice will evaporate faster if surrounded by ice than if insulated. Think about it: the ice is at maybe 20 or 30 degrees F. Hot by dry ice standards. Same thing goes for dry ice left in the freezer. It lasts longer than in room temperature, but not much longer. The thing that makes dry ice work is insulation. If you have dry ice and it's thermally isolated from everything else, it'll last the longest. So my strategy was this: get a blanket, wrap the keg (a cylinder as for soft drinks), and then drop a block of dry ice in there to supercool it beyond what the refrigeration at the store does. I got one of those thermometers to monitor the situation; the kind with a pod that you put outdoors, except I put the pod inside the blanket to monitor the beer temperature. The guy at the store said it would freeze the keg and explode it, but it turns out that a keg has a huge heat capacity, and it just got chilled. This worked really well. I picked up the beer midday on Friday, and arrived in the desert and tapped the beer just before sunset. The beer lasted until Sunday morning (hey, we're on vacation!) and was cold to the last drop. Stuff like this is a great opportunity to be a kid again. I happened to bring two squirt guns, and a wide brimmed sortof bad-guy cowboy hat. I got on my bike, borrowed a bandanna from Jim Gagnon, got on my bike, and went on a crime spree. It lasted until my squirt guns broke. The desert is huge and amazingly flat. The flip side is, you can't take a pee in privacy unless you go into one of the portapottys. There's no trees to hide behind. No brush or other vegitation. No hills. No ridges. Flat. Nothing. You can ride your bike top speed and just ride and ride and ride and there's nothing to slow you down. At night you see cars coming by their headlights, but they're miles away. I spent my days riding my mountainbike nohands. You should check it out, even sometime when there's nobody there. If you drive from idaho, I think it's along the way. Black rock desert, 2 hrs north of Reno. Just drive onto the playa. Park. Get out of the car and walk. Keep walking until you think you can't see your car anymore, but don't look back until you think you're out of sight. (You're not.) I dunno, it's a weird place, totally totally flat. 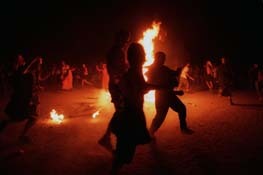 Burning the man: sunday nite. Last weekend I attended what has to be one of the strangest gatherings held on this (or any) continent, the Burning Man Festival. 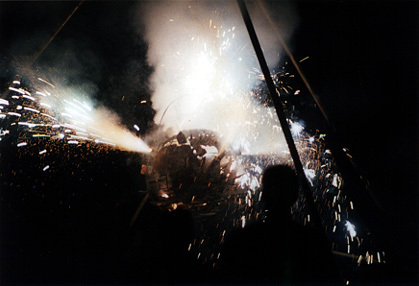 The name comes from one of the few organized activities, the destruction by fire of a huge statue of a man. The man is erected at the beginning of the festival, people party around him for 4 days, then on Sunday night he gets torched. Since the statue is packed full of fireworks, magnesium bits, and other explosive stuff this is pretty spectacular. The Man was about 35 feet tall on a ten foot base. Big flames. A word about the site. 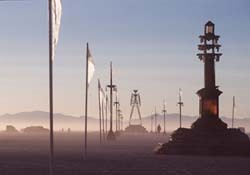 The festival is held in the Black Rock Desert, about 130 miles NE of Reno, in the middle of an ancient lake bed. There are mountains in the distance all around, but for many miles in every direction you are on sand-colored dried mud, perfectly flat, absolutely devoid of plant life, stones, or any other features. Now imagine 7-8 thousand people living out there in a mind-blowingly diverse collection of tents, shanties, RVs, etc., scattered over several square miles of desert more or less randomly with the Man in the middle. The isolation of the site allows everyone to shed all pretense of civilization. One group had a motorized couch to tour camp in. At night it was accompanied by a remote controlled robot floor lamp! Another group transformed an RV into a pirate ship, "captained" by a huge inflatable Gumby. They drove around yelling "ARGH, Avast!" etc. and blasting people with supersoaker squirt guns. One guy covered a motorcycle with fur and made it into a giant aardvark. At one point he was chased around camp by another guy whose car had been outfitted to look like a huge silver shark. Many people walked around the whole time in costume, of quite interesting variety. Other people walked around naked, with or without a layer of mud. 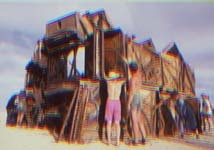 On Saturday a huge sculpture appeared, which was made of old pianos stacked on top on each other and forming a ring about 30 feet in diameter. People inside and outside the ring banged on the strings with pieces of wood, making a very odd, everchanging "music". There were too many other weird things to list here. Nobody slept very much, and everyone partied constantly, ingesting pretty much everything you can imagine. It was totally surreal. We all felt like we'd gone to another planet for a few days. It was very good... I'd say it rivaled last year but in different ways for me. For one thing I had a lot less trepidation about going there, having gone the year before. A good storm would have have been nice, but then it was nice not having a storm. Saturday was a better nite than Sunday, although the Man did burn better thant last year. I read an account on the internet where someone was saying that Burning Man "Vets" know that Saturday is better than Sunday... now I see what they mean. We had a good size group (7) and lots of shade. Suzanne liked it: yesterday morning she was already putting together a list of weird things to bring next year. >It was very good... I'd say it rivaled last year but in different ways for me. You know last year I had no trepidation at all about it, I was like, are we there yet daddy? The crushfest, with the drumsticks, was a religious experience. Well, the conditions had something to do with it... maybe there was 10% disappointment, 60% enchantment, and 30% comfort in feeling that I was in the right place. This year, actually, was a bit anticlimactic. I knew what to expect so there was less of a surprise, less mystique. Crushfest, oh, that thing with the drumsticks, again? Couldn't they do something different, like throw something different into the crowd, like, I dunno, clarinets? I guess that wouldn't work. So for me this year, I think it was 30% disappointment, 30% enchantment, and 40% comfort in feeling that I was in the right place. I'll be there next year. I keep on wanting to do a theme camp. >now I see what they mean. yeah. I kept on trying to make sunday nite into more than it was. Well guys, that may have been the last one. Don't know if you saw the article in Monday's Chron, but the Pershing County board of Supes is trying to prevent next year's festival from getting a permit from BLM. They had two reasons : lack of resources (which may be true - underpopulated county, probably a tight budget) & (what I suspect is the main reason) "incompatible values". In other words they don't approve of all the wildness! The article didn't discuss whether BLM always honors this sort of request, so maybe it's not a done deal yet. Also, just for the record they put the attendance this year at "over 7000", so our guesstimate was about right. Considering that size crowd bitching about 5 arrests seems a little disingenuous. and one death. I read about the death. This guy, the manager or something for polkacide, got drunk in gerlach, went riding his motorcycle in the dust clouds in the desert and did a head-on with an RV. As of that writing, the people ran over with the stolen car were still alive but in the hospital. All in all, a good party, I'd say. I'd be really bummed if they canceled it. But you know the organizers are pretty creative and they know they have to make some major changes. We'll see. If not, well, you'll be able to tell your grandkids. They torched the piano thing at the end. I didn't know what to call it - four walls, no roof, two or three doors. It wasn't a bar. It was... a "structure". Piano soundboards. Old rusted out, burned out piano soundboards. The playa is about 60 miles long and 15 miles wide at its widest. The entire state of nevada is 300 miles wide. I have no idea where he got that number. Other than that it's a good story.